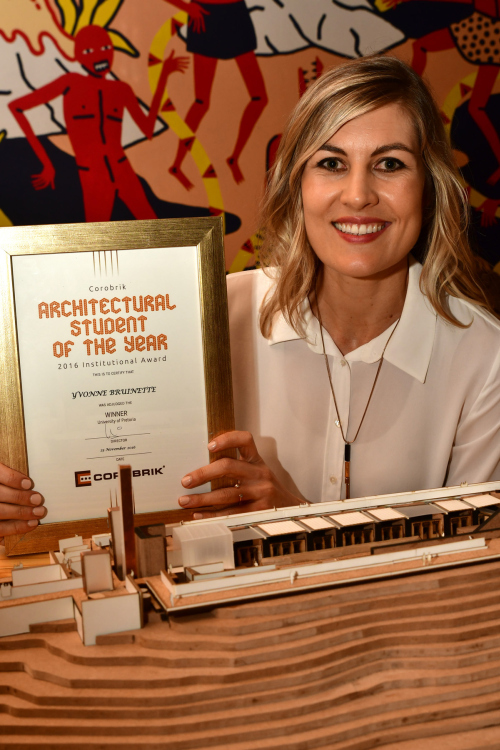 Jean-Pierre Desvaux De Marigny has won the 30th Corobrik Architectural Student of the Year award. 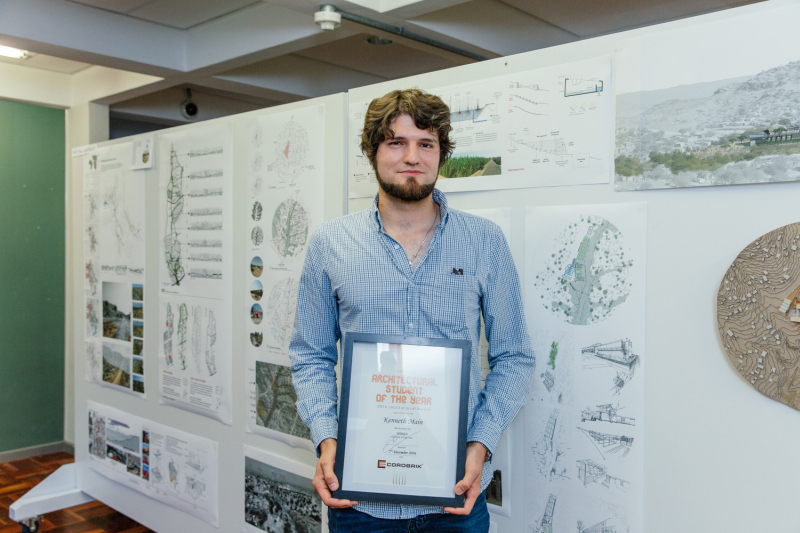 He received this accolade for his thesis entitled “Design for [bio]–diversity” in which he explored the potential of architecture for ecological conservation. 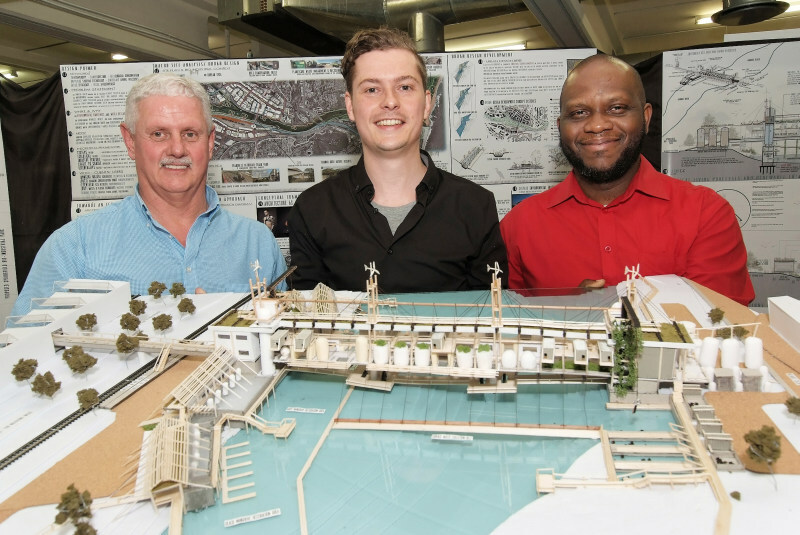 De Marigny proposed an environmental awareness and water research facility in the context of Springfield industrial park/ uMgeni River catchment area, Durban. Research revealed that human existence relies heavily on biodiverse ecosystems to survive, however as population increases, urbanisation and industrialisation occurs, resulting in natural areas often being exploited and degraded, most critically affecting the earth’s fresh water systems. 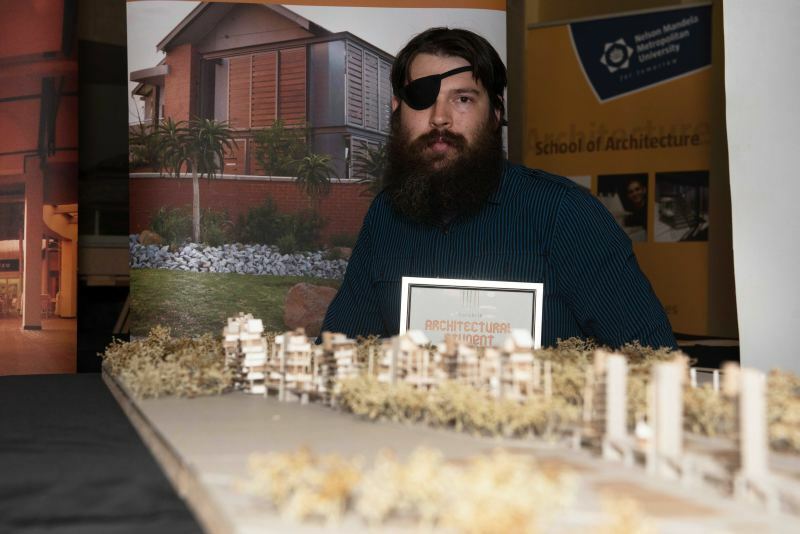 His proposed architectural solution aims to draw an analogy between the machine-dominated environment of the Springfield industrial park and the natural ecosystems found within the uMgeni river. This was achieved through the concept of viewing architecture as similar to that of a mechanical prosthetic device, so that the architecture (industrial machine) could begin to act as rather a natural life support system in the context in which it exists (ecology). Attaching to an existing 440m long pedestrian walkway bridge spanning the width of the river, the facility has a minimal ecological footprint, in addition to providing direct access to the water body to ecologically filter both surface (plastics, rubbers, geo-polymers) and subsurface (human, industrial, agricultural) water pollutants that are accumulated as the watercourse passes through habited areas before reaching Durban’s coastline. As a result, both the technological and ecological solutions allows the architecture to act as a positive hybrid energy contributor, provide space for rehabilitation processes and is able to consistently produce and provide the public, tourists and researchers with fresh fish, vegetables, plants, seeds, flowers, biogas, fertilisers and clean water, who then have the option to relax and enjoy an organic meal, while overlooking the river, or take part in the various educational, ecotourism and research programmes facilitated on site. 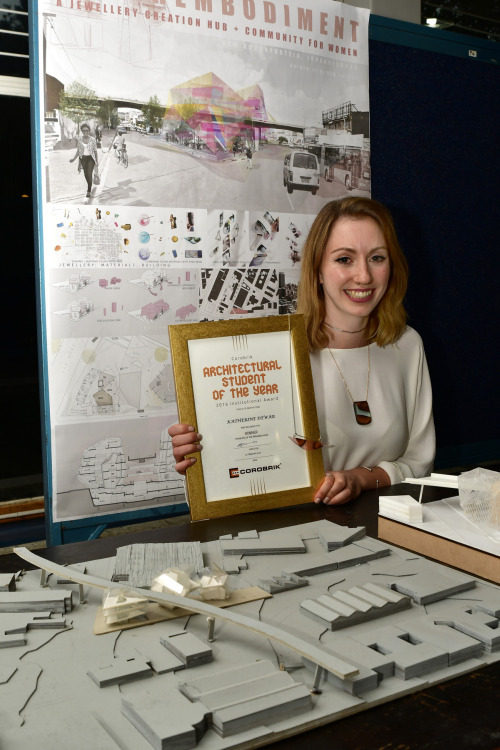 The competition involved the country’s eight major universities where the best architectural students were identified based on their final theses and the winners of each of the regional competitions went on to compete for the national title. Jean-Pierre Desvaux De Marigny whith a model of his winning entry entitled “Design for [bio]-diversity”. On his left is Corobrik director of sales, KZN & Border, Allin Dangers and on his right is Lawrence Ogunsanya, head of the Department of Architecture at UKZN. Thesis title: “Horror in Architecture”, a romantic exploration of the exquisite corpse analogy. As a by-product of previous modes of planning in today’s urban environment, we are left with open undefined spaces between developed areas (known as SLOAP or “Space left over after Planning”). Here infrastructure such as storm water channels, railway lines, and ruins of old industrial buildings remain; overgrown with the incursion of wild nature. These kinds of spaces create urban barriers and breeding grounds for criminal activities. In his treatise, Van Wyk identifies a site of this nature in Uitenhage. He then uses the analogy of a corpse, which facilitates infestation, to develop this site over a period of several years. What emerges is a revitalised ecosystem where the relationship between humans and nature are harmoniously re-defined in what is conceptualised as an “exquisite corpse”. In this process, the inherent functional and sensory qualities of the site are used as starting points for infestation/development. For example, storm-water channels (traces of the existing water reticulation system of the site) are reconfigured to make pleasant waterways that feed agricultural lands which in turn activate “reef points”- or points which facilitate the emergence of a variety of human activities. These ultimately contribute to the development of a new way of inhabiting the new productive landscape with an innovative housing model, all a function of the emergence of the “exquisite corpse”. Thesis title: A community food production facility in Alexandra, Gauteng. The dissertation investigates the potential of architecture to be a device/instrument of knowledge and skills transfer. The user is placed at the centre of the design exploration and becomes the main design generator and informant of the architectural investigation. With its vibrant street life, strong sense of community and complex informal urban fabric, the Alexandra Township in Johannesburg faces many socio-economic challenges and infrastructural shortcomings. This design investigation addresses increased concerns of food-security and lack of communal, open space in Alexandra due to high population densities and overcrowding. The needs of the user inform the creation of a place for the farming, distribution and consumption of fruits and vegetables. Based on community involvement, the architectural response aims to encourage ownership, adaptability and mutual skills exchange. • Addressing the separation between places of food production and cities. • Architecture as a means of knowledge transfer and education. • Principles of responding to the kinetic city. • Principles of materials, local skills and construction methods suited to adaptability. Kim Geldenhuys’ community food production facility in Alexandra. Thesis title: Urban Acupuncture: Architecture as a catalyst for environmental and water conservation in the context of the Kilimanjaro Informal Settlement. 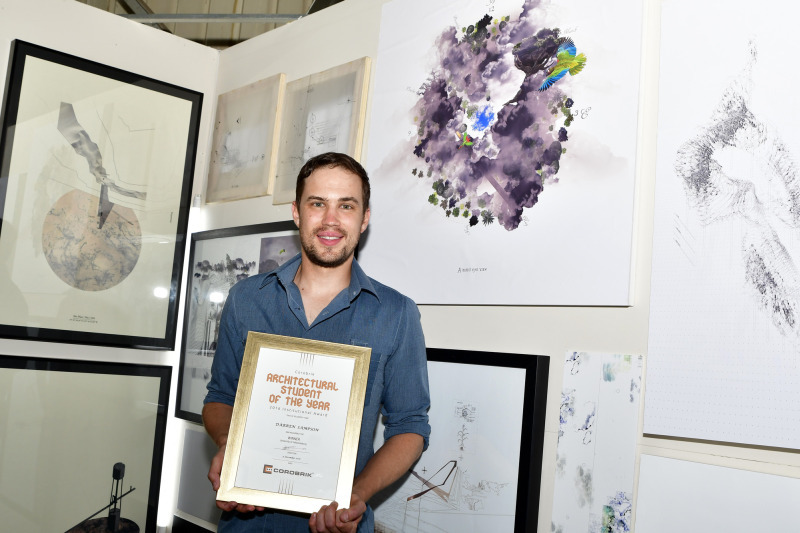 Kenneth Main’s approach deals with the issue of waste contamination and water conservation in the natural and urban landscapes of the riverbed, its edges and man-made peripheries at the northern boundary of the city of Windhoek along a stretch of polluted riverbed in the Kilimanjaro Informal Settlement (KIS). In the creation of an architectural approach “urban acupuncture” is explored to create architecture that has the potential to influence areas beyond its physical boundaries. In addition, it can re-establish and re-imagine the value of the river for its unseen influence in shaping Windhoek as rapid urbanisation is taking place. Aspects of environmental degradation, water conservation and lack of basic infrastructure form a basis of inquiry to which an urban framework is proposed. Most simply, this framework acts to establish an alternative and more efficient system which collects, stores, filters and reuses wastewater for both drinking and irrigation purposes through a series of four contextually assigned architectural devices. Utilising the by-products of this urban frame work (reed bed filtered water and potable water), the KIS Agricultural Learning Centre is proposed. The Centre provides a point of exchange for both in-situ filtered drinking water and fresh produce that is grown at the centre establishing a link between this infrastructural insertion and its public and social constructs. Thesis title: “The Light House”. The Light House is an architectural proposition that uses a palette of light and dark to produce what the Swiss architect Peter Zumthor calls an “experience”: an all-encompassing, sensory mood that relies on the sophisticated manipulation of light and dark to convey a number of ideas about site, presence, beauty, harmony and nature. The project relies on the treatment of light and dark as form, material, substance, and mood. It investigates the relationship between performance and form and the relationship between architect and user which is taken from Jonathan Hill’s reading of the “two occupations of architecture: the activities of the architect and the actions of the user” which is of importance in my project since everyone who visits it constructs it differently. The project is situated along the edge of a light ‘territory’ that is created twice every six seconds by the light emitted from the Farol De Dona Maria Pia, an existing lighthouse on the edge of Praia. Two sites, Site # 1- Sea, Land, Light and Site # 2 – Ocean, Sky, Light have been articulated, but should be read as a single ‘site’ for the entire project. Thesis title: “The Heritage Portal: An Experiential Narrative” based at Westfort in Pretoria. Hidden in the western outskirts of Pretoria lies the remains of what used to be the protector of the West, known as Westfort. Just before the outbreak of World War II, the fort was dismantled, stripped down for its steel and left to fall into ruin (Van Vollenhoven 1998:25). The site also includes the former Westfort Leper Institution which, since its closure in 1997, has been illegally occupied by informal settlers who adapted the site to accommodate their needs. Today, it still functions as a segregated community and together with the Fort, illustrates the consequences of ruination and isolation over time. The dissertation addresses the ongoing process of ruination and isolation within highly contested continuums of change. By rehabilitating this forgotten ruin, Westfort might awaken mysteries of the past and simultaneously evoke a need to tell stories about it. The Heritage Portal will act as the mediator in celebrating the continuity of our collective and continuous South African heritage through the experience of narration. The intention of the project is to protect the heritage significance of the Westfort precinct, secure its future value, and introduce continuity through experiential architecture. Yvonne Bruinette from UP with her Heritage Portal model. Thesis title: Art gallery questioning topographic and institutional edges by sculpting inhabitable thresholds. In her thesis, Lana Bramley questioned topographic and institutional edges by sculpting inhabitable thresholds. The proposed gallery is placed on the periphery of campus to allow access to visitors from the university as well as from the public. The building negotiates the edge of the campus by addressing the public realm and current prohibited access. The gallery captures a place that allows the art to breathe upon its enclosure. Thesis title: Hyper-embodiment, a jewellery creation hub and community for women. 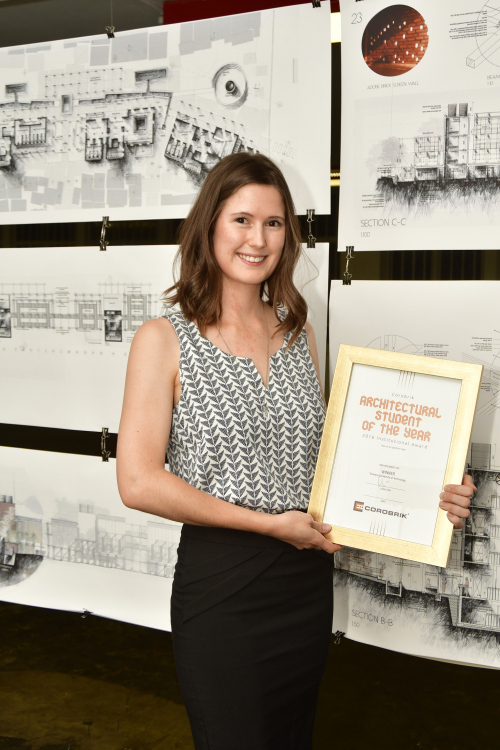 Katherine Dewar’s thesis is an approach to discussing the interface between spaces for women in Johannesburg’s inner-city and jewellery as a connector of the body to place. She proposes the jewellery hub be situated in New Doornfontein, a space that is male dominated and where women are present but seem to be largely excluded, unsafe and vulnerable, is also full of vibrancy and activity. This area has the potential for a positive and radical cultural change, but currently remains disconnected and not inclusive for all people. “By looking at spaces for women, as well as jewellery being a ‘location’ between the body and architecture, I aim to take an architectural design approach that solves issues of making space for women, and for jewellery practices in Johannesburg,” says Dewar. Three multi-storey connected buildings on the main pedestrian route on Albertina Sisulu road will be used for the hub and community centre. The ground floor will offer community spaces and jewellery galleries, with floors above for classrooms and workshops that embrace, and introduce, a space for women to learn, create and engage with each other. 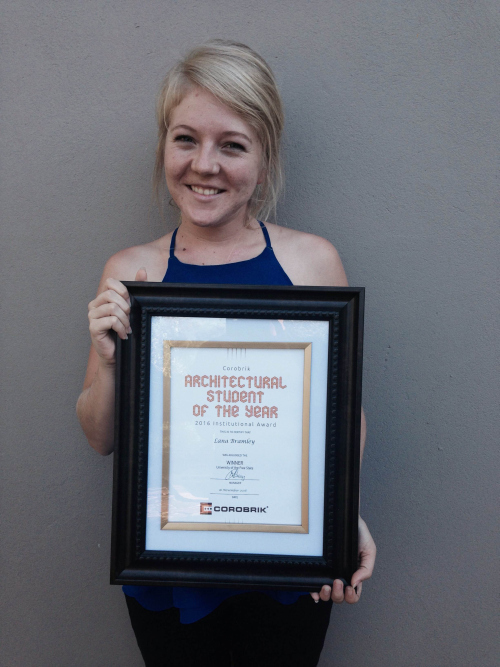 Wits winner, Katherine Dewar’s jewellery creation hub and community for women.